What are some misconceptions about life insurance that I shouldn’t believe? While getting term insurance quotes is easy, there are still some misconceptions about life insurance in general. Before I started working in the industry eight years ago, I had no idea how life insurance worked. I barely even knew what it was. So, I understand when other people don’t necessarily get it either. 1. I’m not the breadwinner. I don’t need life insurance. Whether you make less money than your partner, work only part-time, or are a stay-at-home parent, you are still just as valuable as your breadwinning counterpart. If anyone relies on you, you need to have life insurance. If you’re a stay-at-home parent, consider what would happen if you died suddenly. Who takes care of the kids while the surviving parent goes to work? Who does the laundry? Who cooks dinner? According to a 2017 Care.com survey, 1 in 3 respondents said they spend at least 20% of their annual household income on child care. 73% of these respondents say their job has been affected because of child care plans falling through at the last minute with 64% having to use sick days and 54% being late to work as a result. You may not bring home the most money, but you are needed. Your loss would be detrimental to your family and term life insurance can protect your family’s financial needs. 2. The life insurance company will try to get out of paying the death benefit. Life insurance companies aren’t out to rip people off. There is a need out there to protect families from financial loss caused by a death in the family and insurance companies fulfill this service. As long as you are honest on your life insurance application and pay your premiums, the life insurance company will pay the death benefit when and if the time comes. 3. I can’t get term insurance quotes on my spouse or loved one. Not only can you run term life insurance quotes on your loved one, you can also buy a policy on them. As long as you have insurable interest and their consent, purchasing a life insurance policy on someone else is common. Spouses buy insurance on each other often. Parents also buy life insurance on their children and vice-versa. Business partners also often have policies on one another. » Learn more: Can I Buy Life Insurance on Someone Else? On Quotacy, it’s easy to run term insurance quotes on yourself and anyone else. After you choose a policy, you’re brought to your dashboard. Here you can either decide to run more quotes or continue on completing your application. The person you want to buy life insurance on will give consent via signatures, a telephone interview, and a medical exam—unless you’re buying a no exam policy. Term life insurance won’t eliminate your loved ones’ emotional pain if you were to die suddenly, but it can help them remain financially stable and maintain their standard of living. 4. I am too young to think about life insurance. People often say I know life insurance is important. I’ll look into it when I’m older. What people don’t realize is that the younger you are, the less expensive life insurance is. Run term insurance quotes online and change the birth years. You’ll see significant changes in the premiums. A young 30-something couple hopefully has decades of time to spend with one another—but life can change in an instant. Buying an inexpensive term policy now can give you peace of mind and be lifesaving if you die unexpectedly and leave loved ones behind. 5. I should name my child the beneficiary of my life insurance policy. If your child is under the age 18, do not name them a beneficiary of your policy. If you name them a beneficiary and die before they are 18 or older, the money provided by the policy (the death benefit) gets stuck in the court system until a property guardian is named to manage the funds until your child reaches legal age. Name a trusted adult as the beneficiary. This person can manage the death benefit funds for your children’s benefit. Name a living trust as the beneficiary. Your children can be beneficiaries to the assets named in the living trust and a trustee can manage the funds. Name your child the beneficiary in accordance with your state’s UTMA/UGMA laws. This means that you name a custodian to manage the funds while your child is under 18 but as soon as the child becomes a legal adult, the money is transferred over. » Learn more: Can a Minor Be a Beneficiary? 6. Once I get a quote, I’m automatically approved for coverage. When you get a life insurance quote, this is an educated guess on how much you will pay for coverage. Many factors go into evaluating an applicant for life insurance. It would be impossible to include all these factors into a quoting tool algorithm. Instead, Quotacy considers the most common factors that affect life insurance pricing, e.g. your age, height and weight, smoking status, blood pressure and cholesterol, etc., to provide you a quote. Most of the time (70% of the time on average), the quote you receive will be what you end up paying for life insurance. So, while you are not guaranteed approval as soon as you run a term insurance quote, your Quotacy agent will work hard to get you approved. We shop your application to all the different life insurance companies we work with to find you the best coverage available. 7. Life insurance is expensive and unnecessary. Just look at GoFundMe.com to see if life insurance is unnecessary. There are thousands of families asking for help because a provider unexpectedly died and now they are struggling to pay for a funeral and bills. A little bit of life insurance is better than none at all. Buy what you can afford. When you get a quote on Quotacy, you can adjust the sliders on the quoting tool to see how changing your term length and coverage amount affects your estimated cost. Jennifer is a 30-year-old mother of two young daughters. She wants to buy life insurance to make sure her children will be provided for even if she were to die prematurely. She runs a few quotes on Quotacy. She starts by checking to see how much a $1,000,000 term life insurance policy that lasts 30 years costs. At just under $50 per month on average, she decides that is a bit too much for her budget. Because Jennifer wants to have this back-up protection all through her daughters’ college years, she decides to adjust her coverage amount, not the term length, to fit the life insurance policy into her budget better. She drops the coverage amount to $500,000. At just under $30 per month on average, the 30-year $500,000 term life insurance policy fits much better within her budget. 8. I don’t need quotes on life insurance if I have other investments and a portfolio. But if you are part of the 99% of America that has loved ones who may feel financial loss or burden upon your death, then you need life insurance, even if you have savings accounts, are investing in the stock market, and have retirement plans in place. When you’re deciding how much life insurance you need, you can subtract your current assets. 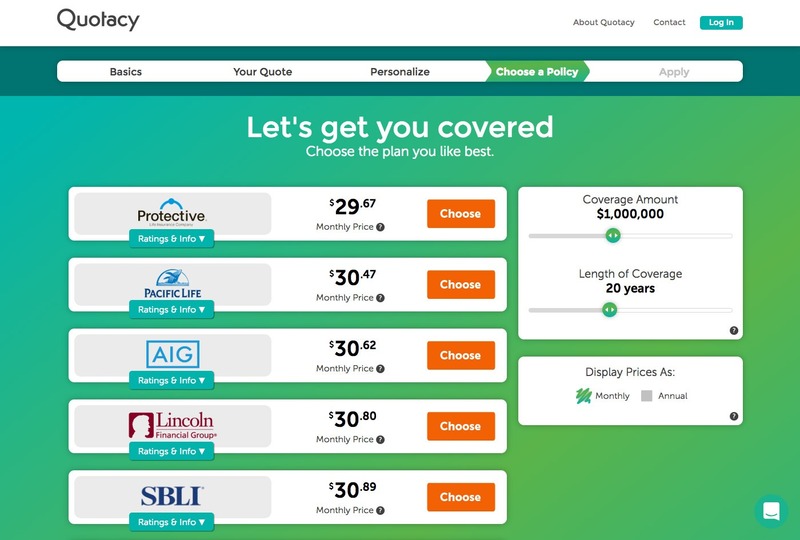 Quotacy has a life insurance needs calculator that can help guide you as to how much coverage you need. Joseph, 40, has a wife, Beth, 38, and three children ages 4, 7, and 9. Joseph works full-time as a bank manager and makes a decent salary bringing home an average of $4000 per month. Beth works part-time at a daycare so she can spend much of her time with their children. She brings home about $1200 per month. 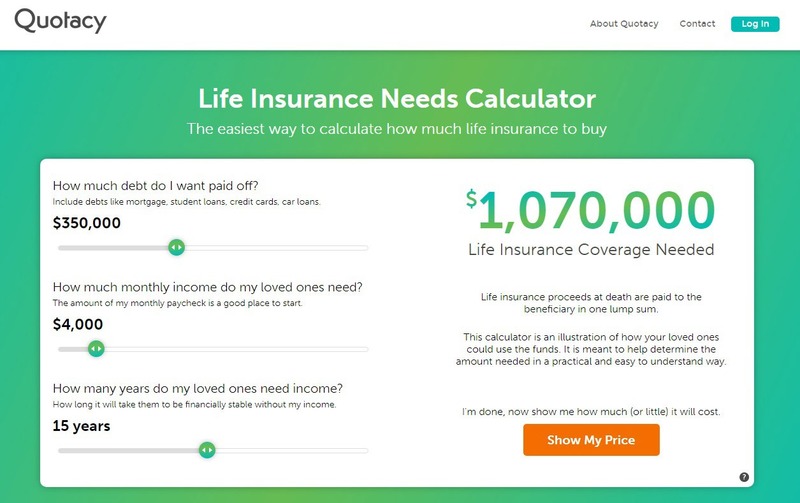 Joseph isn’t sure how much life insurance coverage to buy so he tries out the Quotacy needs calculator. He wants to be sure the mortgage (a $325,000 loan) and his private student loans (currently owing $25,000), don’t become a burden on his wife so he starts at $350,000. He then enters $4000 into the calculator as a monthly income estimate, since that is how much he currently brings home. Finally, he decides he would ideally like to make sure his family is provided with enough life insurance to last them 15 years—enough time for their children to get through college. According to the term life insurance calculator, Joseph should buy $1,070,000 in term life insurance. However, Joseph already has a $50,000 group life insurance policy through his work, a $75,000 whole life insurance policy his parents purchased on him when he was young and transferred over to him when he got married, and $30,000 in investments (IRA and 401(k)). Joseph can subtract this total of $155,000 from the calculator’s total of $1,070,000 and purchase a term life insurance policy with $915,000 in coverage. When running quotes on Quotacy, he sees that the difference between a $900,000 and $950,000 policy is only $2 per month so he decides to apply for a 20-year $950,000 term life insurance policy with an estimated monthly premium amount of $49.67. 9. My retirement fund will cover everything if I pass away. Term life insurance is designed to last during your family’s most financially vulnerable years. Often, these are the years when you’re still quite a few years away from retiring. If you die before your time, your retirement accounts have likely not matured. As you can see from Joseph’s example above, families require a great deal of money to maintain a certain standard of living. How much you have in your retirement accounts obviously plays into whether or not there is enough to cover your end-of-life expenses and make sure your loved ones aren’t left with a large of amount of debt they will struggle to pay off, but in most cases your IRA or 401(k) won’t provide your family with enough funds to pay for the mortgage, daycare, college tuition, etc. 10. If I die, my debts are forgiven. If you die and have a mortgage, the lender still expects to be paid. If you don’t have life insurance, your family can either cut costs elsewhere to try and pay the monthly payments or sell the house. If you have life insurance, your family can continue living in the home. If you die and have private student loans, the lender still expects to be paid. Whoever co-signed on the loans with you becomes responsible for paying them off. With life insurance, your beneficiary can use the death benefit to pay off the loan. If you die and have credit card debt, the debt will be discharged unless you have co-signers or live in a community-property state. In a community-property state, spouses share assets and debt so your spouse may become responsible to pay the credit card balance. With life insurance, your spouse can pay for any debt he or she may become responsible for upon your death. If you die, you don’t get out of paying taxes. If you currently owe taxes, the government still wants to be paid. After you die, your final tax return will still be due. Your estate may also be taxed. This would be separate from your income taxes. Life insurance can help pay off all possible taxes. 11. When getting a quote, I should apply for as much as I can get. Rather than applying for as much insurance as you can get, apply for as much as you can afford. 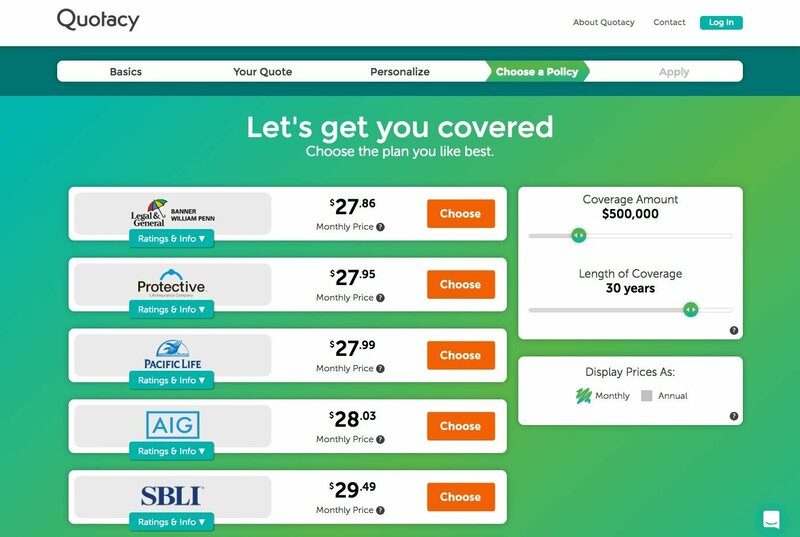 Applying for a 30-year $1,000,000 term life insurance policy that costs about $100 per month only makes sense if you can comfortably afford to pay $100 per month. If you purchase this 30-year policy but decide to cut expenses and stop paying it after 15 years and let it terminate, your family is no longer protected. Buy a policy you can afford to keep up payments on for the entire term length. 12. My original quote is set, I can never increase the amount of coverage I have. Sometimes we have applicants that will apply for a certain amount and end up wanting to change it. As long as you haven’t signed the final policy delivery form that makes your policy active, we can amend your paperwork without a problem. 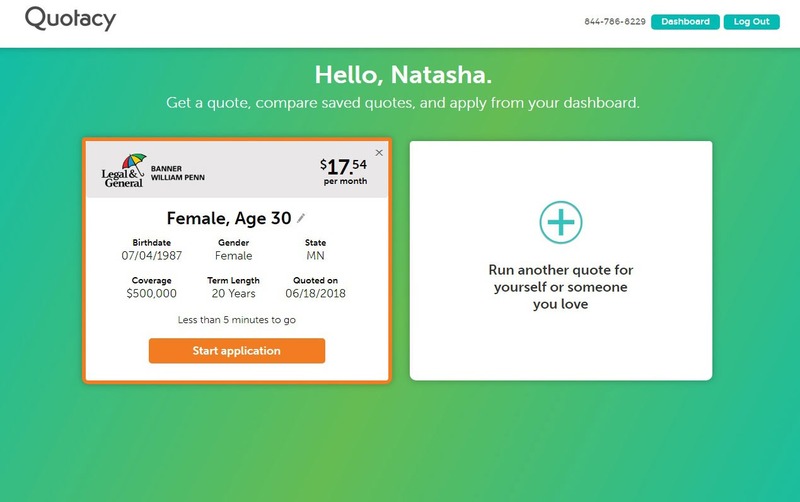 There are two common scenarios of applicants wanting to increase their face amount before officially activating their policy. The first one is that they ask us to increase their coverage amount after talking to their spouse and decide they should add a little more. The second one is that we end up finding them a lower premium amount than they originally thought so they now can afford to increase their coverage. Even after your policy is inforce, you can still buy more life insurance if you haven’t hit your insurability limit yet. There’s no rule that says you can only own one life insurance policy. 13. I have to get a medical exam to get a life insurance quote. 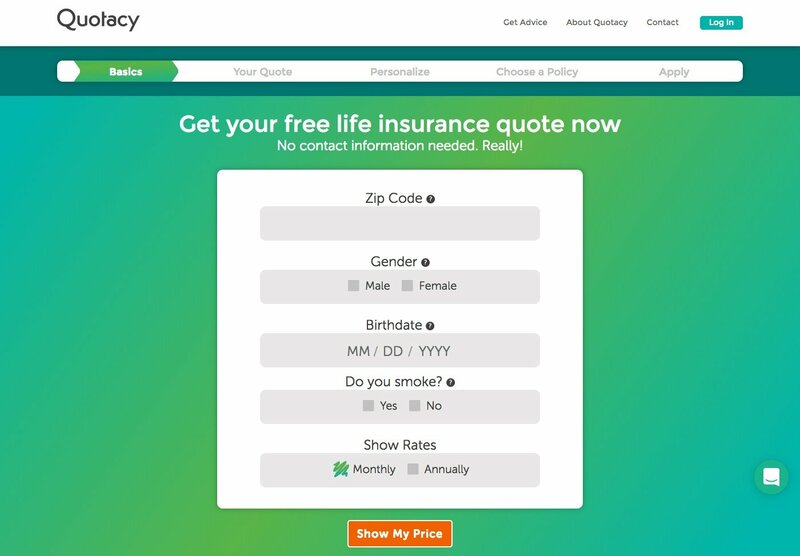 Getting a life insurance quote is free through Quotacy. You don’t even need to give us any contact information. However, if you want to apply for life insurance most applicants will need to get a medical exam. The exam isn’t too bad. It lasts between 20 and 30 minutes and the examiner will come to your home or workplace—wherever is most convenient for you. The life insurance industry is working to make the buying process easier for consumers by eliminating the medical exam altogether. The industry isn’t quite there yet, but there are options if you prefer to skip the exam. Check out this blog: What Is a No Medical Exam Life Insurance Policy?. 14. Getting term insurance quotes means you are only getting temporary coverage. Term life insurance is designed to last during your family’s most financially vulnerable years, not your entire life, so term life insurance is temporary coverage. However, this doesn’t mean you can’t change this. Have you heard of convertible term life insurance? Most term life insurance policies are convertible. This means that you can change your term policy into a permanent policy without going through underwriting again. If you have a term life insurance policy and later decide you need permanent life insurance, this is when convertible term life insurance becomes very handy. Peter and Jessica each have a 20-year term life insurance policy. They named each other the beneficiary of each other’s policies so they can continue to provide for their infant son even if something happened to one of them. Five years after buying their policies, Jessica gives birth to a daughter with special needs. Both Peter and Jessica realize that their daughter will likely need assistance for the rest of her life. Their temporary life insurance needs then become permanent. Both Peter and Jessica decide to convert their term policies into whole life policies. When you convert a term life insurance policy into a permanent policy, your premiums will increase. Permanent life insurance is far more expensive than term, but some families do have a need for permanent insurance. 15. Buying term insurance later in life is not beneficial. Life insurance is cheaper the younger you are, but this doesn’t mean it’s neither affordable nor beneficial later in life. Maybe you are 50 years old and became co-owner of a business. Buying a term life insurance policy when you’re 50 years old is very common. Many life insurance companies even have term policy options for individuals who are 80 years old. A 10-year term option would be something to consider in this case. A 10-year term life insurance policy can protect the earned income of a spouse whose paycheck you are counting on as part of your retirement savings. Many couples are playing catch up with their retirement savings, so to have a spouse die whose income you were counting on as part of your retirement nest egg can be a big loss financially; in addition to the emotional loss of a soul mate. What if I am just looking to get a term insurance quote? Buying life insurance can be a little nerve-wracking. It’s an important purchase—you’re buying financial protection for your loved ones, but you’re also giving away a lot of information such as your medical records. At Quotacy, we don’t ask for any of your contact information to see term insurance quotes. We want you to get to know us and get comfortable about the life insurance buying process before having to commit to anything. Run as many term insurance quotes as you like without living in fear of your contact information being sold to third parties or being inundated with phone calls. After entering your information, you’ll see term insurance quotes from many different top-rated life insurance companies. We usually simply recommend just going with whichever quote is the least expensive. Once you complete your online application, your Quotacy agent takes a look at it and makes sure the insurance company you chose to apply is your best option. For example, if you’re pregnant and chose to apply to Protective, your Quotacy agent would contact you and let you know that your pricing may likely be less expensive with Legal & General because Legal & General allows most women to subtract pregnancy weight. Other companies are likely to determine your costs based on your current pregnancy weight. These differences in underwriting can highly affect your pricing. It’s always up to you to decide which life insurance company to ultimately apply to; we just want to make sure you know your options. Why is term life insurance beneficial for me and my family? If you were to die unexpectedly, having term life insurance in place can save your surviving loved ones from financial tragedy. The main purpose of term life insurance is to replace your income. Anything your paycheck was used to pay for such as your mortgage, car payments, and your children’s education, can still be paid for with the life insurance death benefit. Term life insurance is inexpensive, the death benefit is normally tax-free, and it’s exempt from probate. Being exempt from probate means that you receive the money quickly because it doesn’t need to be passed through the court system via a will, and it also means creditors cannot collect from it. And don’t worry if you believed some of these term insurance myths—many people do. At Quotacy, we’re here to educate and make life insurance easy to understand and purchase. Now that you know all the facts, it’s time to get your quotes. Getting term life insurance quotes without personal information is easy here on Quotacy. Run a quote for yourself or for your loved one. After you apply, your Quotacy agent will keep you updated every step of the way as your application turns into an inforce policy. There’s no better time than the present to protect your loved ones with life insurance. We recently had a customer ask us, isn’t it true that a life insurance company will try to get out of paying my death benefit if I die? So we decided to tackle that along with four other life insurance myths today. Life insurance companies try to get out of paying the policy death benefit. Myth number one: Life insurance companies try to get out of paying the policy death benefit. Life insurance companies are not in the business to try and rip off customers. When you buy a life insurance policy there is a two-year contestability period. If you die within the first two years of owning the policy, the insurance company has the right to look into your case and make sure you did not misrepresent yourself on your life insurance application. For example, claiming on your application that you don’t drink alcohol but when, in fact, you had liver disease from alcohol abuse, that would be a misrepresentation. After the first two years of the policy, the insurance company can no longer deny your death benefit claim except for in the case of blatant insurance fraud. Right. So, for example, if you and your policy beneficiaries decide to fake your death to rake in hundreds of thousands of dollars and then it’s later discovered that you commit insurance fraud, the insurance company can come back and sue you for the money that they paid. Also, if homicide is listed as the cause of death on the death certificate many insurance companies will probably investigate that death a little bit closer to make sure the insured was not killed for the life insurance death benefit. I’m not the breadwinner, so I don’t need life insurance. Myth number two: I’m not the breadwinner. I don’t need life insurance. Daycare is really expensive and this is just one reason why the number of stay-at-home parents in the United States is on the rise. Stay-at-home parents may initially think they don’t need life insurance because they don’t bring home a paycheck but it’s really important for stay-at-home parents. If a stay-at-home parent died, does a surviving parent have the needed funds to hire babysitters and pay for daycare? What about taking time off work to spend time with your children after your partner dies? Stay at home parents, you may not bring home a physical paycheck, but you’re worth more than you’ll know and you should definitely look into buying life insurance. I’m too young to think about buying life insurance! Myth number three: I am too young to think about life insurance. It’s very common for us to be talking to someone explaining what life insurance is and they’ll say Life insurance sounds important. I’ll look into that when I’m older. Not everyone realizes that as you age, the cost to buy life insurance also increases. So don’t wait for a health scare to look into buying life insurance. The younger you are, the less expensive insurance is. And with both term life and whole life insurance, your premiums remain the same throughout the whole life of the policy. So it’s best to lock in affordable rates when you’re young. I’m not in shape! I can’t get affordable life insurance! Myth number four: I’m not in shape. I can’t get affordable life insurance. While what’s affordable is subjective, the average American overestimates the cost of life insurance by three times and Millennials overestimate it by five times. You don’t have to look like Ryan Reynolds or Blake Lively to get affordable life insurance coverage. You can get a term quote on Quotacy to estimate your costs without divulging any contact information and there is no obligation to buy. The life insurance I have through my job is enough. Myth number five: The life insurance I have through my job is enough. Group life insurance through your employer is a great benefit. But what many people don’t realize is that your policy doesn’t follow you. So if you quit or are terminated, your life insurance coverage is also terminated. Let’s say you’re severely injured in a snowboarding accident and you’re in the hospital for three months in a full-body cast and with a concussion unable to work. In many situations, employers can terminate the employee if they’re unable to fulfill their job duties. Once you’re terminated, your life insurance coverage ends too. But after you’re out of the hospital and fully healed up you can apply for a new life insurance policy. However, you’re older at this point not to mention that traumatic brain injury in your record. And while you may indeed be approved for coverage you’ll be paying higher premiums than you would have if you would have bought life insurance before your accident. Don’t wait until something happens to look to buy life insurance. Term life insurance is affordable, customizable, and can be life-saving for your family. If you have questions about life insurance, make sure to leave us a comment. Otherwise, tune in next week when we talk about the differences between term life insurance and whole life insurance. Bye!